The past couple of years have seen a boom in the number of organic markets in Johannesburg, from the long running Bryanston Organic Market to the relatively new Jozi Food Market, which we wrote about some time back. This past weekend we headed out north, to the BluBird Wholefood market in Birnam, to take a look at what this market had to offer. 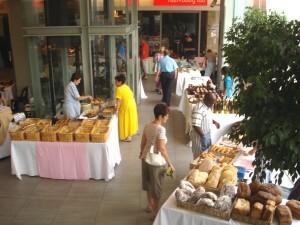 The food market is held at the trendy new BluBird shopping centre which is just off Corlett Drive and down the road from Wanderers cricket ground. The food market is held every Sunday morning from 9am to 2pm and has a range of foods available from fresh breads to home-cured biltong and cheeses to pates, spices and olive oils. There’s Thai food, Indian spices, samoosas and croissants, all gathered together under the architectural eves. Although relatively small there is still a wide enough selection of foods in offer at the market to make it worth a trip on Sunday morning. It’s perfect if you’re looking for something for a light Sunday lunch. Our personal haul this time around included a couple of loaves of bread (including a fantastic rye loaf), a jar of sweet pate, a bag of biltong which was finished before we left the market, and some haloumi cheese. The BluBird centre is unashamedly upmarket and you’ll have to mingle with the well-heeled enjoying Sunday breakfast, but for the food it’s worth at least one trip.